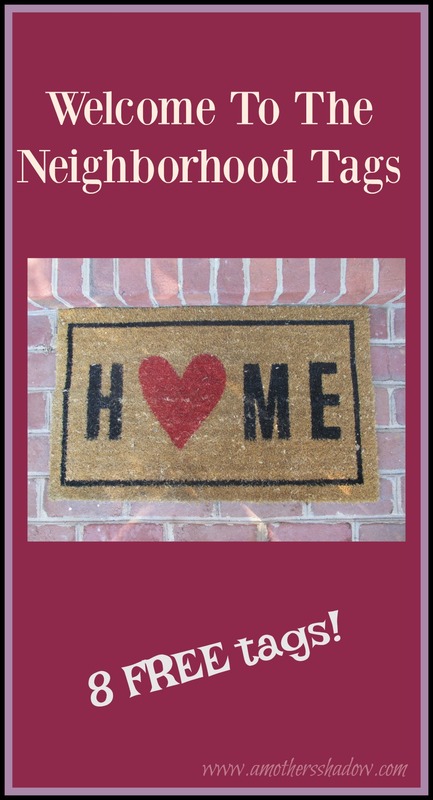 Use these FREE Welcome To The Neighborhood Tags to meet your new neighbors! Most of us find it a bit uncomfortable to introduce our self to someone we haven’t met before, or hardly know. 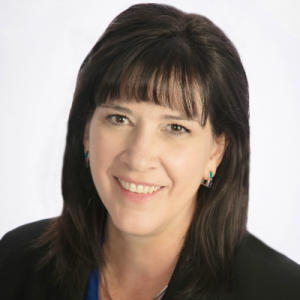 However, helping the new move-in’s in our neighborhood feel welcome is important for many reasons, a few are: unity, safety, for harmony and it really helps if people are on good terms and that comes as they know each other. One of the best ways to do this is to take a small gift or treat and say ‘HELLO’. It truly is one of the kindest things we can do. I’ve put together some ideas of how to use these tags, along with a few links of where to find a few of the items to check out if you’d like. Most important, get out and meet those new neighbors so they can enjoy your friendship! Here I used dish cloths and dish soap. 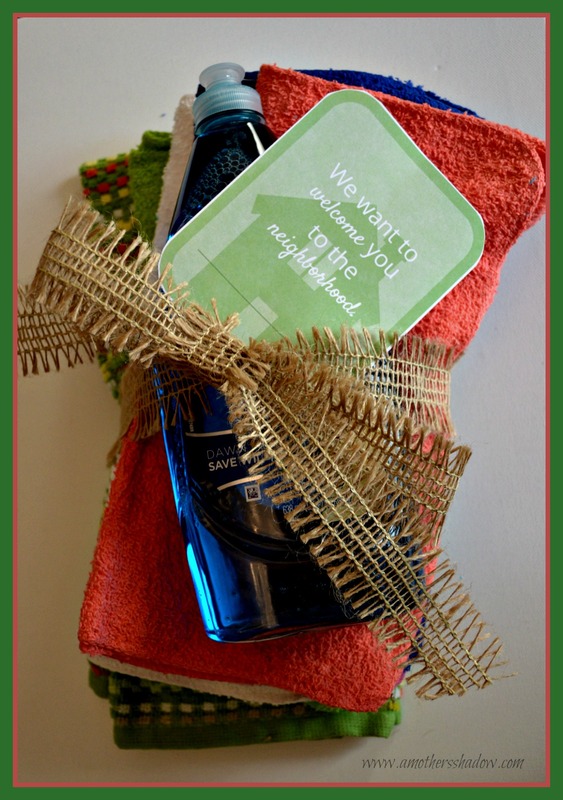 Keeping some good quality dish cloths on hand like THESE to give a couple with the tag and soap would be a great welcome gift. 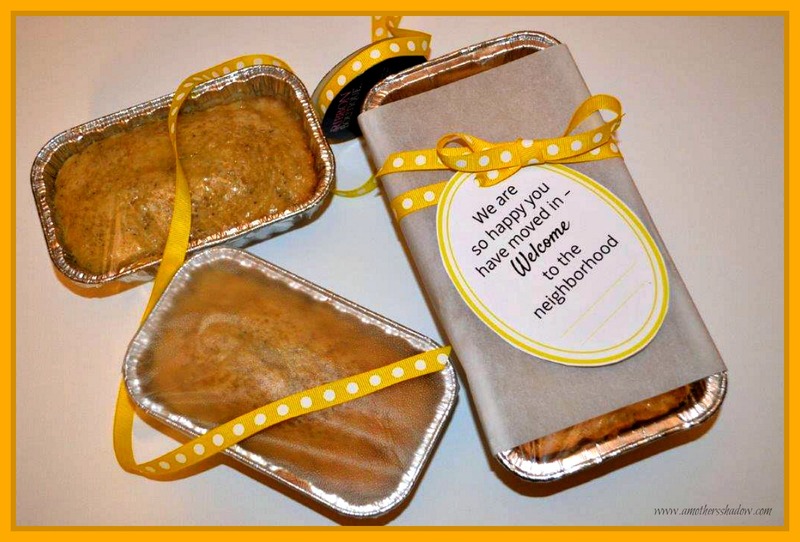 Making quick bread in disposable pans and attaching with a bright ribbon would make anyone feel welcome. I made my BEST Poppy Seed Bread for this and it’s always a favorite. This little package is not only fancy, but it’s very useful. 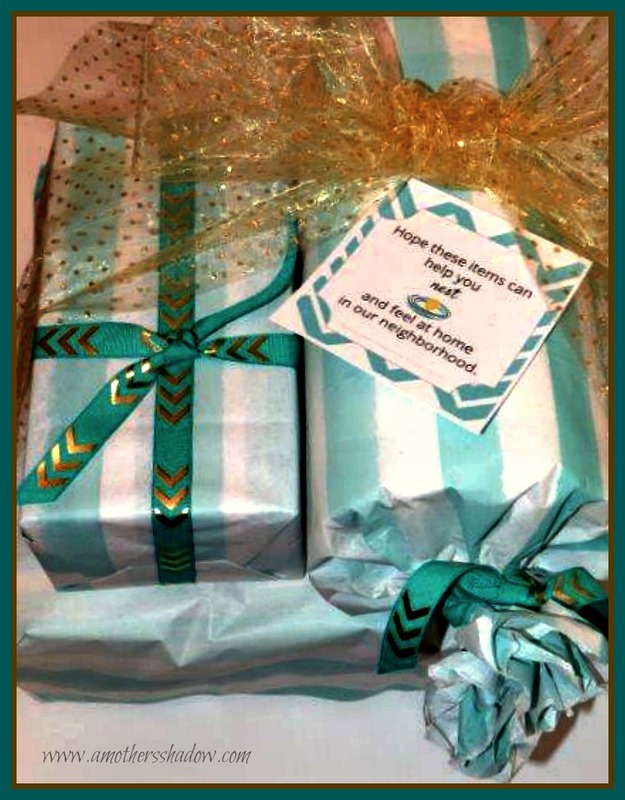 Wrapped individually are: 3 pack of toilet paper on the bottom, and on the top are paper towels and a box of tissue. Not expensive, yet the new-move-in would feel very special as they ‘nest’ with this tag and it’s supplies. Who doesn’t like chocolate right! 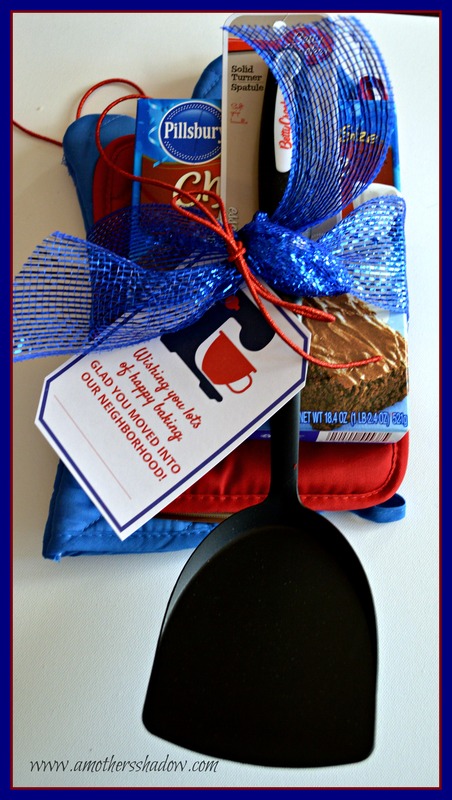 A brownie mix, hot pad, oven mitt and spatula round out this welcome gift and tag. The possibilities are endless with a kitchen tag: a whisk, any quick mix, measuring cups, kitchen scissors—the skies the limit with this tag. A cleaner and a really good microfiber towel like THIS or kitchen towels with this tag. Give a one or two of the towels with some cleaner and it would definitely be welcomed by anyone when moving in, since there is always cleaning to be done. Any sweet will compliment this tag. 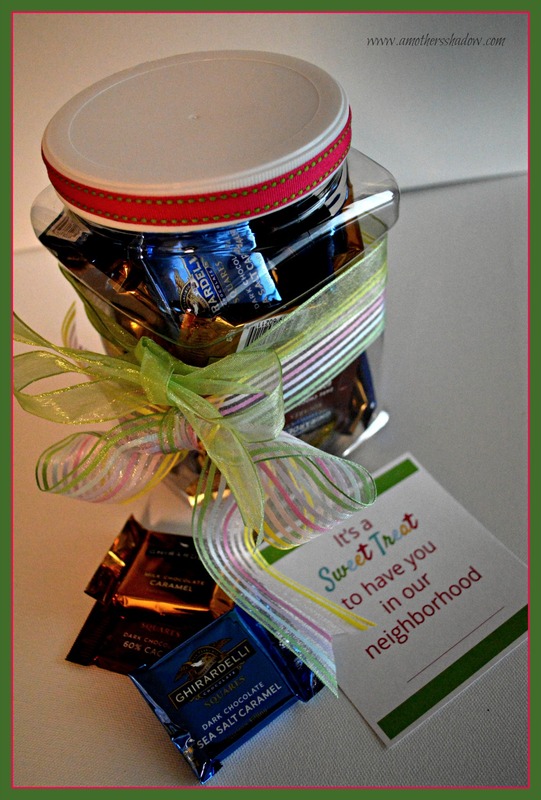 Simply attach a bag of candy, or a jar, or wrap with a ribbon if you’d like and head out to meet the new neighbors. 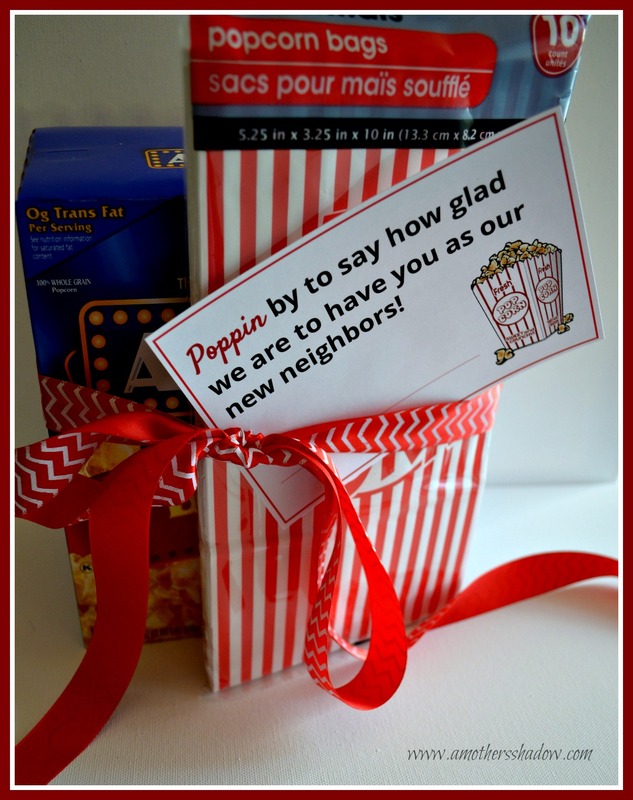 This tag is EASY to use with a bag of pre-popped popcorn of any kind, or a box of ready-to-pop. It doesn’t matter, because you are making the newbies know you are so glad they moved it. 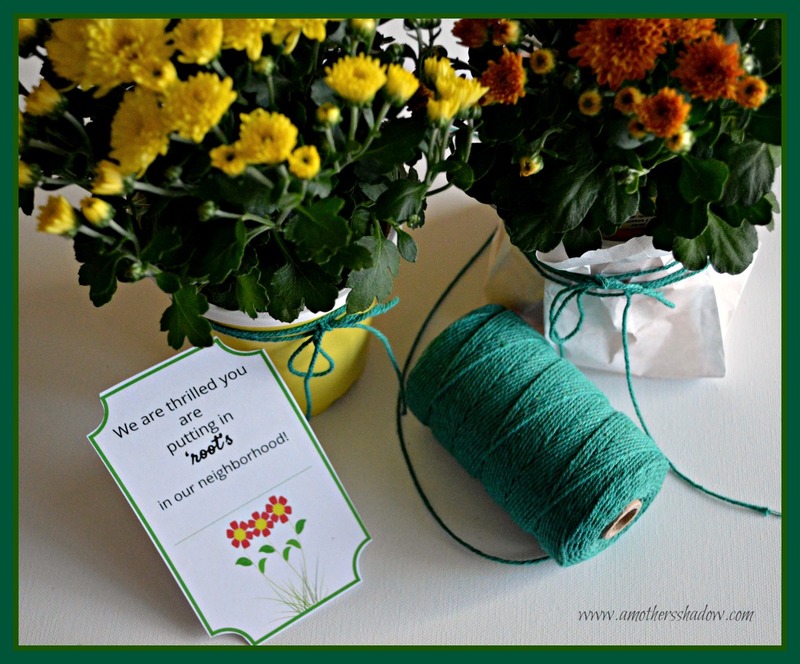 Pick up a house plant, vegetable or herb plant and this tag is ready to go. If the container isn’t quite what you want to show off, trim a craft sack of any color to use as a cover. HERE is a twine collection that should cover about any need. And now you can use these EIGHT Welcome To the Neighborhood Tags that are editable/fill-in to make it quick and relaxed as you get out to welcome your new friends.